Propelled by punk energy, Smoking Popes deliver fast, hooky power-pop. On their live album, the band seems in fine shape, captivating the audience with crunchy guitars, soft, but ample vocals, and a punchy rhythm section that knows how to quiet down when needed and rock out when it is called for. "Paul" is a pure pop song. Crunchy mid-tempo guitars light the fire, while the versatile rhythm section follows the guitar's lead. Steady and intimate, the light guitars in the verse set you up for the crash-boom-bang of the chorus, before everything calms down, only to repeat itself. "Need You Around" cranks up the punk engine and roars off into the night, blasting the guitars, while the solid, meaty rhythm section bounces away, keeping things jumpy and fun. "Before I'm Gone" keeps your mouth watering with energetic, highly flammable power-pop, while the light "Stars" paces around the rock, offering up a steamy pop song with all the crunch of the rock, but less noise. And then there is "Gotta Know Right Now" and "Writing A Letter," two more prime examples of how explosive this band could be - and was. 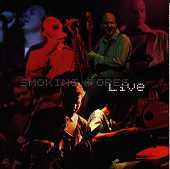 If you're a Smoking Popes fan, this live album is not to be missed. The energy, sweat, excitement live within this album, contained in each song, and only unleashed upon each listen. Here is crunchy power-pop the way it should be: loud and live. I'll give this an A-.